So, I have made it to the gym a couple times a week this month, which is good. It's not having a major impact on my weight yet, but I have to hope that eventually it will. But my weight is really depressing me these days, especially since I'm coming up on a couple of milestones on my calendar - 10 years since I got married, and 5 years since my lowest weight. The horizontal lines mark every 20 pounds. First arrow is my wedding. Approximately 5 years later, I was at my lowest weight (and yes, I gained about 20 pounds in the first two years of wedded bliss). Second arrow is when I got pregnant. Third arrow is when I gave birth. 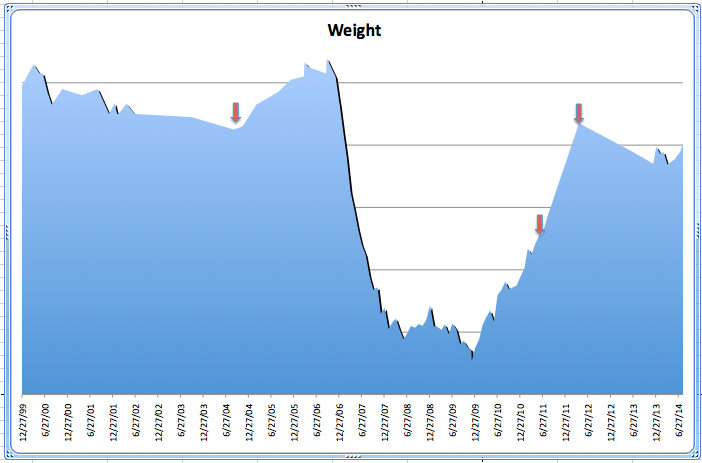 It's a little hard to tell from this graph, but I'm about 5 pounds less now than when I got married. And I *hate* how I look in my wedding photos. So, that's a pretty sobering graph. I also got another set of numbers crunched - after a 4 hour food and water (?!) fast on Sunday, I got measured on one of the "in body" body composition machines. (FYI: 4 hour food fast, no problems - but 4 hours without water was hell and I had a terrible headache all day, even after I rehydrated.) The results were really miserable. I tried to convince myself it's just the "before" picture, but damn, it's hard to swallow. But I did work out after that, doing a full set on the weights circuit plus some kettle bell work, and on Tuesday I did 45 min on a bike (even though my legs were still mad after that kettle bell work! ), and yesterday I did an aqua aerobics class (which was great for the stretching actually - plus I did get my heart rate up a few times). Tomorrow is another aqua class. Will do the weights again Saturday or Sunday. And I'm trying to eat healthier, but it's an on-going struggle. Sorry for the radio silence yet again. Amazingly, my weight is staying roughly the same, despite the lack of dieting and exercise. It's still much higher than it should be, but at least it's not getting worse? I joined a gym on Friday, mostly for activities for my son, but I'm really hoping that I'll actually get to go work out on my own as well. Did a water aerobics class and it was great. I also did a short circuit on a few of the weight machines, so I'm sore today. ;) It's a good sore though, and one that I haven't had in several years. I'm going to meet with one of the trainers again on Sunday to get set up on all of the weight machines to do full circuits.